This card was made by Lea Christensen. What a simple, yet very beautiful card! 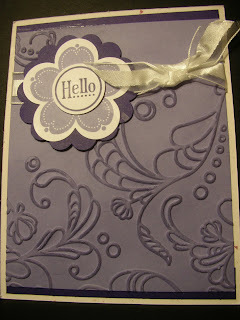 She used the Elegant Lines embossing folder and the Posy Punch hostess set. Her color choices were Whisper White, Concord Crush and Wisteria Wonder.